* Functional Ecology Laboratory, Unit of Systematic and Ecology (UNESIS), Department of Biology, Javeriana University, Bogotá, Colombia. ** Herpetology Laboratory, Unit of Systematic and Ecology (UNESIS), Department of Biology, Javeriana University, Bogotá, Colombia. SUMMARY: Transparency technique to demonstrate cartilage and skeleton has been used from years 70. This consists basically of the muscle digestion through an enzyme (trypsine), and the staining of cartilage and skeleton using alcian blue and alizarin red on specimens previously fixed to formalin. This technique can be used to study the state of the cartilage and the bones in different stages of the development and to observe abnormalitys. Also it can be used to demonstrate museum specimen skeleton preserved in liquid. In this article is showed the application of this technique for the first time in rodents and adult bats, besides some annotations to optimize the procedure. KEY WORDS: Chiroptera; Rodentia; Cartilage; Bone; Morphology. RESUMEN: La técnica de transparentación para evidenciar cartílago y esqueleto ha sido empleada desde los años 70. Esta consiste básicamente en la digestión de músculo a través de una enzima (tripsina), y la tinción del cartílago y el esqueleto usando azul de alcian y rojo de alizarina sobre especímenes previamente fijados en formol. Esta técnica puede emplearse para estudiar el estado del cartílago y los huesos en diferentes etapas del desarrollo y poder observar anormalidades. También puede ser utilizada para evidenciar el esqueleto en especimenes de museo preservados en líquido. En este artículo se muestra la aplicación de esta técnica por primera vez en roedores y murciélagos adultos, además de algunas anotaciones para optimizar el procedimiento. PALABRAS CLAVE: Chiroptera; Rodentia; Cartílago; Hueso; Morfología. The technique of cartilage staining for small vertebrates proposed by Dingerkus & Uhler (1977) and Hanken & Wassersug (1981) has been applied so far to fish, frogs, turtles, birds, and small mammals. Song & Parenti (1995) made modifications to the technique in order to show the nervous system in fish, as well as the cartilage and skeleton. In mammals, several studies have been conducted to stain cartilage and bone in rodent fetuses (McLeod 1980; Kimmel & Trammell 1981; Young et al., 2000; Menegola et al., 2001, 2002). These studies have shown the condition of skeletons in embryos of different stages, as well as any abnormalities in their development. Kimmel & Trammell treated specimens to reveal cartilage and skeletons in adult rats. On the other hand, Adams (1992) applied to bat fetuses the technique of cartilage and bone staining developed by Hanken & Wassersug. This staining technique, to the best of our knowledge, has only been applied to bat fetuses. In our study, we apply the techniques described by Dingerkus & Uhler and Hanken & Wassersug to the transparency of cartilage and skeleton in bats and adult rodents. Studies to stain fetuses have been of great utility for the analysis of skeletal abnormalities due to xenobiotic agents with pathogenic activity (Brunet et al., 1998; Menegola et al., 2002). Mutations caused by these agents have been shown in the fetuses of rodents by means of cartilage stained with alcian blue, such as the study of Brunet et al. who observed the abnormal expression of a morphogenetic protein of bone during the early stages of the rodent's development. Besides being able to analyze different causes and consequences of the skeletal malformations in the first stages of the development, staining the fetal skeleton has allowed the rapid and detailed observation of the bones without need to use expensive techniques, such as X-rays (Menegola et al., 2001). In addition, staining techniques that reveal the skeleton and cartilage can be useful to detect important characters in the establishment of phylogenetic relations, as well as in studies of comparative anatomy, ontogeny, and evolution. Studies of this type have been carried out with bats fetuses, as well as with other taxa (Adams; Sears et al., 2006). The evaluation of morphological structures by means of this technique has allowed us to understand better the function of the anatomical systems and even to re-evaluate explanations on the corporal structure in several species.For instance, some authors have indicated that frugivorous bats of the genus Chiroderma were lacking nasal bones. Straney (1984), however, using the alcian blue - alizarin red technique, demonstrated the opposite and showed bone sutures that were only visible in the youngest individuals. Adams, by means of staining, compared differences in the morphology of the forearms of juveniles and embryos of Myotis lucifugus and Rattus norvegicus. He found that in bats the growth of the forearm accelerates during the postpartum stage and that the radius prevails on the ulna at the joint with the humerus, while it was the opposite in rats. Pedersen (1995), using bone and cartilage staining techniques to compare the morphology of bat fetuses with different system of echolocation, compared the development of bats that emit ultrasounds nasally with those who do it orally. Alcian blue and alizarin red have also been used in studies on evolutionary aspects of bats. Sears et al. observed the development of finger elongation in embryos of the bat species Carollia perspicillata and they compared those findings with embryos of the rodent species Mus musculus. They found that the size of the hypertrophic zone (where the chondrocytes differentiate) was larger and that the greater proliferation rate of the cartilage cells explained the elongation of the fingers in the bats (Sears et al.). Wyant & Adams (2007) recently developed a method to analyze the growth and prenatal development of the bat Mops condylurus by staining fetuses with alcian blue and alizarin red. They found that the surface area of the wing was positively correlated to fetal mass, whereas the growth of the skull was correlated with the growth of the forearm. Here we show the modified procedure for adult bats and rodents; we also include some commentaries related to the nature (e.g., size) of the material that was processed. Preservation and fixation: At the moment of collection, the material must be stored in either 70% ethanol or 10 % formalin. It is necessary to identify the preservative on the specimen label as the preservative that was used will determine the next step of the protocol. If the material was stored in ethanol, it must be fixed with formalin (i.e., the specimen is injected copiously with 10 % formalin into the viscera and is also immersed in 10 % formalin for a period from 2 to 3 days). Alternatively, if the material was initially stored in formalin, pass directly to step 2. Washing.To eliminate any excess formalin, the specimen is immersed and rinsed in several changes of distilled water for 2 to 3 days. Cleanliness. During the process of washing, skin and eviscerate the specimen. Partially remove the plagiopatagium, taking care to leave the dactylopatagium intact in order to keep the phalanges and metacarpals joined. Rewash the specimen in distilled water for 1 day. Rehydration. Place the specimen in a bath of 95 % ethyl alcohol for 2 hours. Repeat for 2 hours in a new bath. Place the specimen in baths of successively decreasing concentrations of 75 %, 40 %, and 15 % ethyl alcohol (2 hours per bath). Store the specimen in distilled water for about 8 hours. According to Hanken & Wassersug, this step also helps to reinforce the fixing of the alcian blue to the cartilage. Muscle digestion. Immerse the material in a saturated solution of 30 ml of sodium borate, 70 ml of distilled water, and 0.5 g trypsin enzyme (trypsin from porcine pancreas). Since trypsin works better at slightly elevated temperatures (Kishimura et al., 2005), place the container with the specimen in a convection oven and heat to a maximum of 25°C. Change the solution as necessary when it becomes turbid. Heat the specimen until the muscle is soft and gelatinous or the cartilage and the bones are observed. This result can take several weeks depending on the size of the specimen. It is necessary to check the material every day since prolonged exposure to trypsin can dissolve the skeleton. For relatively large bodies, increase the concentration of trypsin to improve the process of digestion. Bone staining. Transfer the specimen to 0.5 % aqueous KOH. Add alizarin red S in powder form until the solution becomes deep purple in color. Leave the specimen in this solution for 24 hours. Bleaching and dehydration. Subject the specimen to the following series of washes: glycerin-0.5 %-KOH solutions (sequential series: 3:1, 1:1, and 1:3), adding a few drops of hydrogen peroxide to help enhance the transparency. Leave the specimen for several days in each step, until the bleaching of musculature is complete and the surpluses of the alizarin red are removed. Storage. Place the specimen in pure glycerin for permanent storage. This procedure was quicker for smaller sized bats than for larger ones. Specifically, Desmodus rotundus took more time than did smaller bats to exhibit the upper ribs, on both the dorsal and ventral surfaces. This was probably due to the presence of muscular fibers in the pectoral muscles that included three types of muscular fibers of rapid contraction (type II) and one type of slow contraction fiber (type I) (Hermanson et al., 1998). In other species of bats, the pectoral muscles are composed of one or two types of type II fibers and no type I fibers (Hermanson et al., 1993). With Desmodus we increased the concentration of the KOH-glycerin solution from 0.5 % to 2% (step 8), but we did not obtain the expected results. After storing it in pure glycerin, the bat was removed from that solution and again treated with KOH at 5 % for 15 days. The specimen was re-stained with alizarin red since the bones had lost a bit of the red color. The next day the specimen stored again in pure glycerin with a few drops of hydrogen peroxide. At the end of this modified procedure, the ribs were more evident than before and the degrees of transparency and staining were adequate (Fig. 1a). As we confirmed with Desmodus rotundus, if it is necessary to repeat the muscular digestion step, the specimen should be re-immersed in KOH - alizarin red in order to recapture the color that probably had been debilitated or diluted by the trypsin. Likewise, KOH used in a high concentration (in our case 5 %) is very useful to enhance the transparency of large specimens that are highly muscular, such as Desmodus. hindlimbs are shown here. B) Detail of the wing transparency of bat Desmodus rotundus. 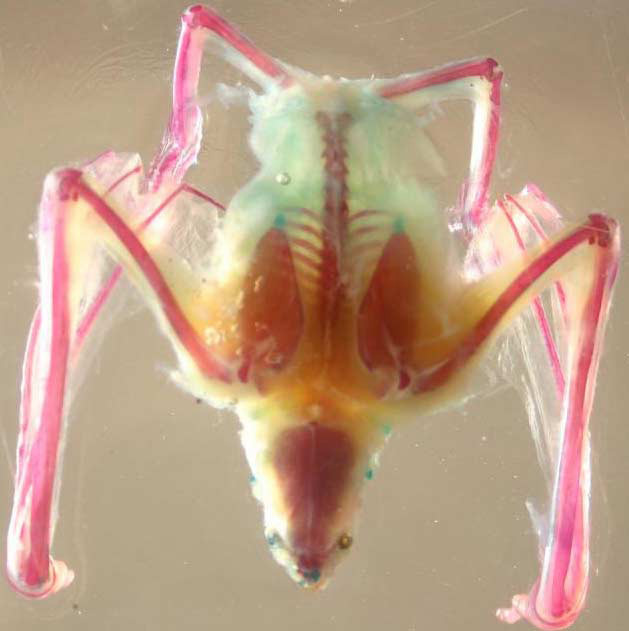 The dactylopatagium of Desmodus, besides being transparent, exhibited metacarpi and fingers that remained connected after they had completed the protocol (Fig.1b).With other bats, transparency was not attained initially. Therefore, we repeated steps 6 to 10 of the protocol and obtained improvements with respect to the degree of transparency attained without suffering and negative effects due to over-staining. The reversibility repeatability of the steps associated with muscle digestion was also mentioned by Klymkowsky & Hanken (1991). Unlike for bats, the procedure for mice worked well and the steps to attain transparency were carried out successfully (Fig. 2). 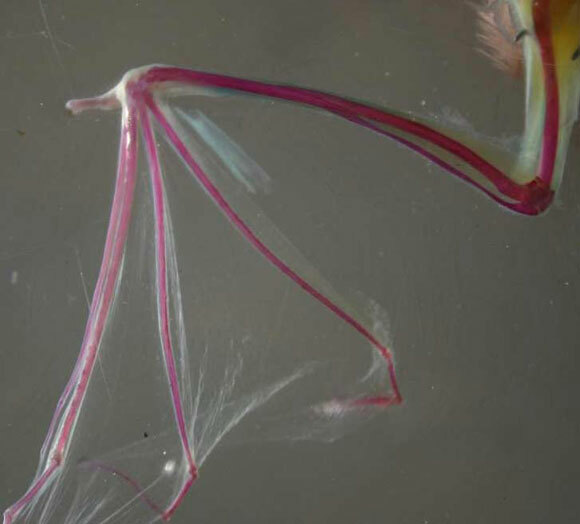 Although transparency was attained for specimens that had been frozen and stored in a freezer, for both bats and mice the muscles were heavily pigmented. This level of pigmentation may cause difficulties for certain types of studies. For specimens that subsequently will be treated to reveal the cartilage and skeleton, we recommend that they be preserved initially in ethanol or formalin. Fig. 2. Adult rodent (Thomasomys laniger). In the photo forelimbs, hindlimbs, tail vertebrae and cranium. We are grateful to the Laboratory of the Functional Ecology and the Herpetology Laboratory of the Javeriana University for the logistic and economic support in the accomplishment of this work. We are also grateful to Jeffrey P. Jorgenson for his comments on an earlier version of this paper.